This film, based on Nicholas Sparks’ 2013 novel by the same name, is the most recent in a long string of Sparks’ big screen adaptations. After ten movies, it seems like it's down to a science – the science of really good-looking actors writing love letters and getting caught in the rain. 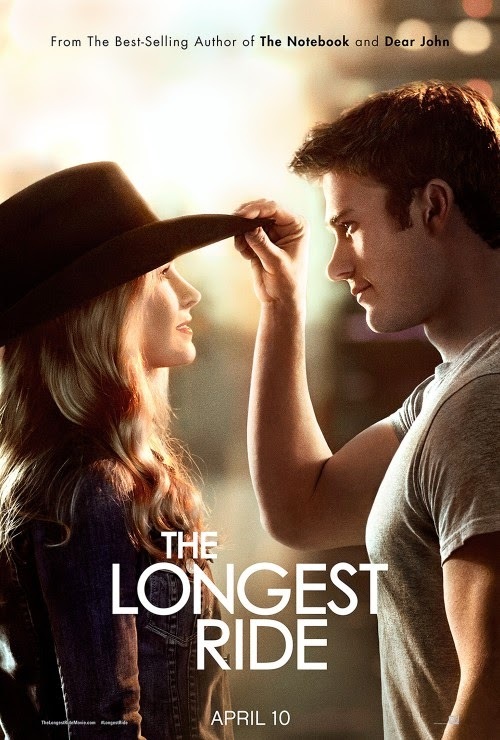 THE LONGEST RIDE is the love story of a sorority sister and a bull rider. Britt Robertson (DAN IN REAL LIFE, SCREAM 4) plays Sophia, a Manhattan-bound art history student at Wake Forrest University. Sophia’s sorority sisters drag her along on an outing to the local bull riding competition – to meet hot bull riders, obviously – where she meets North Carolina rancher and professional bull rider Luke, played by Scott Eastwood (FURY, TROUBLE WITH THE CURVE, INVICTUS). They meet and seemingly fall instantly in love. The real story begins when their paths cross with an elderly widowed man named Ira – played by Alan Alda (MASH) – who is holding on to the memories of his own love story. As Sophia reads through letters from the old man’s past, the movie follows them back in time. Ira and his love letters become a guide for Sophia through trials of young love. Flashbacks to the life of Ira and his wife Ruth, played by Oona Chaplin (GAME OF THRONES), are nostalgic and heart-warming. The audience learns more about Ira and Ruth than the characters on the movie poster, and flashing back to the present day actually becomes a little disappointing. Perhaps it’s because they are spliced up by the flashbacks, but Luke and Sophia’s characters are underdeveloped. Their storyline is heavy on the longing stares and the brooding gazes. So seeking audience compassion for them seems like a big ask. That being said, with the product they were given, these two young actors sell it. Eastwood’s character is charming and likable (and, wow, does he look like his dad Clint). Robertson is believable, her character is a little unbalanced – written as a strong female, but actually falling victim to some very typical female character romance formulas. The most obvious addition to the Sparks romance story this time is the bull riding. Luke is a former champion bull rider, struggling to recover from a fall and claim his spot at the top. He is driven by a desire to support his mother and save their family’s ranch. His father, also a rider, died young. Bull riding (i.e. “The toughest sport on dirt”) is, like it or not, a thrilling sport and scenes at the ring are intense. Riding is also the biggest source of tension for the young couple: dangerous as it is, Luke can’t seem to quit the sport he loves. But I don’t think it’s a spoiler to say that, thanks to Nicholas Sparks, it all turns out okay in the end.